Hand pallet wrap (also known as stretch wrap, pallet wrap or stretch film) is a quick and economic means of wrapping, stabilising and securing palletised goods. 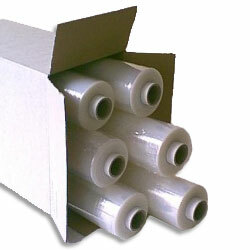 The stretch nature of the strong plastic film enables it to keep items tightly wrapped ensuring stability of load. Hand pallet wrap also protects items from dust and weather in storage, or transit. Excellent puncture and tear resistance. Vastly improves load stability. Blown pallet wrap is the most popular general purpose tacky pallet wrap . The standard core size is perfect for use with our hand pallet wrap dispenser.